The 10x10 west coast frame tent has a rigid framework which allows the tent to be set up without the use of a center pole. West Coast Frame Tents must be anchored using ropes, ratchets, or cables to hold it in place. West Coast Style Frame Tents are very popular for: weddings, graduation parties, birthday parties, anniversary parties, or any outdoor party event. 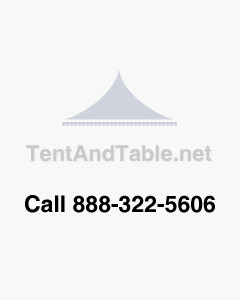 No center pole gives the West Coast Style Frame Tent optimum space.